The Bay Area’s median home price increased 14 percent year over year in November, driven by strong appreciation in Silicon Valley. Sales of homes priced above $2 million grew by 72 percent in San Mateo and Santa Clara counties, 95 percent in Marin County, and 81 percent in Alameda County. These higher-priced sales were a big driver of the home price surge. General market competition intensified in November, with a 10 percent increase in absorption rates and seven fewer days on the market year over year. Inventory shortages continue dragging down overall sales, which were 2 percent lower than last November. Fears of proposed tax changes and the potential impacts on homebuyer deductions may have fueled some of the November surge in demand. Home prices In San Francisco and Silicon Valley are about 50-plus percent higher from the last peak. The final month of 2017 appears set to close with strong Bay Area housing-market numbers, at least regarding prices. In November, home sales activity was 2 percent lower than last November, but that comes with important caveats. Wildfires certainly impacted the affected and surrounding areas. Sonoma County home sales were up 13 percent from last November, and in adjacent Marin County, sales jumped by a remarkable 24 percent. Both regions’ November increases reversed October’s year-over-year notable declines, a function of the wildfires. With November’s increase in sales, Sonoma County’s overall year-to-date housing activity is on par with 2016. Napa County, on the other hand, saw a 12 percent year-over-year decline in sales and is the only Bay Area region where year-to-date sales are lower than they were in 2016. Sales were lower across all price ranges except for homes priced between $1 million and $2 million. Napa County has the lowest level of sales of all Bay Area counties, and overall, 85 fewer units have sold so far in 2017. A detailed analysis of Wine Country real estate activity will be available on our blog later this week. November sales also declined year over year in Contra Costa and Santa Clara counties due to a continued rapid decline in inventory of homes priced below $1 million and a consequent lack of sales in that price range. In Santa Clara County, the inventory of homes priced below $1 million was 54 percent lower than last November. While inventory declines are not new, November once again showed falling supply across the region, down 21 percent on an annual basis. Santa Clara County again led the declines, with a staggering 39 percent drop in inventory. Figure 1 illustrates overall year-over-year inventory changes, inventory changes for homes priced between $1 million and $2 million, absorption rates, and median days on market. Numbers in red show relatively stronger market competition when compared with other regions. For example, Marin and San Francisco counties saw 10-day drops in the median days that homes spent on the market. As noted, Napa County has seen 2017 market conditions slow in comparison with last year. Nevertheless, the second half of last year was relatively stronger in Napa County, thus a year-over-year comparison may just reflect normalizing trends. In addition to the 21 percent year-over-year decline in inventory, Figure 1 also illustrates annual supply changes for homes priced between $1 million and $2 million, which dropped by 11 percent from last year. Again, while falling affordable inventory is unfortunately a continued and alarming trend for the Bay Area, the region also faces a declining supply of higher-priced homes, which are in demand for buyers in half of local counties. Finally, Figure 1 illustrates absorption rates for listed inventory and the change from last year. Again, numbers in red suggest relatively more competitive markets, with higher increases in the rate of inventory absorption. 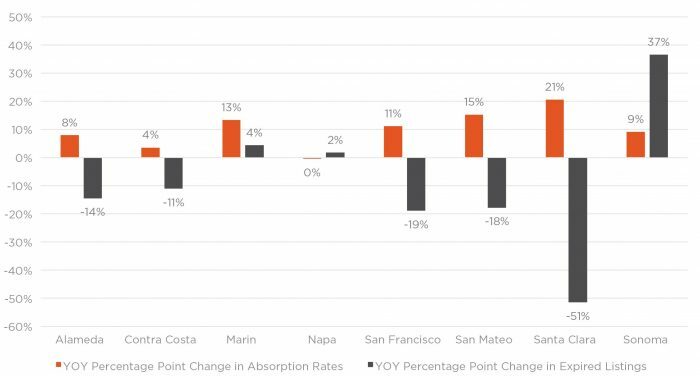 Silicon Valley saw the largest increase in absorption, followed by Marin County and San Francisco. All Bay Area regions showed higher absorption rates averaging 50 percent, a 10 percent increase from last November. These market indicators point to strong demand, which would have pushed transaction activity much higher this year if more inventory was available. Figure 2 summarizes changes in absorption rates, as well as changes in the share of listings that expired when compared with last November. Napa County and Sonoma County trends deviate from other Bay Area counties, a reflection of the October wildfires. Figure 2: Annual changes in absorption rates and expired listings by Bay Area county. One of the most striking insights from November data is the increase in median prices seen across the region, a trend not anticipated at this point in the Bay Area housing cycle or at this time of year. In November, prices were 14 percent higher on an annual basis, with Silicon Valley median prices jumping as much as 26 percent. The gain is partially driving the increase in sales of higher-priced homes — $2 million-plus — which increased by 50 percent in November and by 72 percent in San Mateo County. Again, the strong market for homes priced above $2 million characterized most of 2017 across the entire Bay Area. 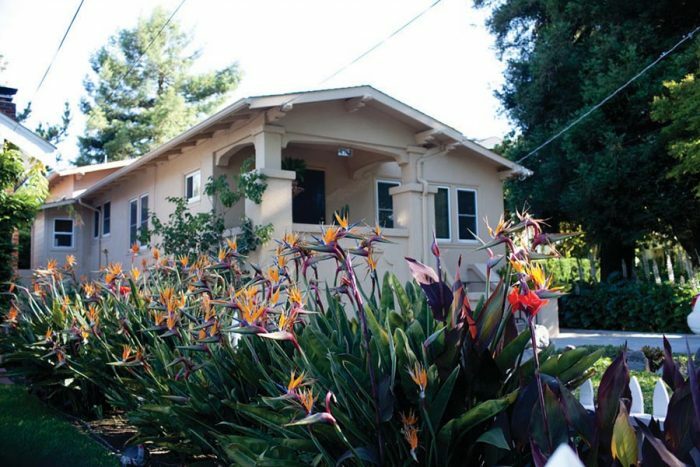 Overall year to date, the median home price has grown by 10 percent in the Bay Area. 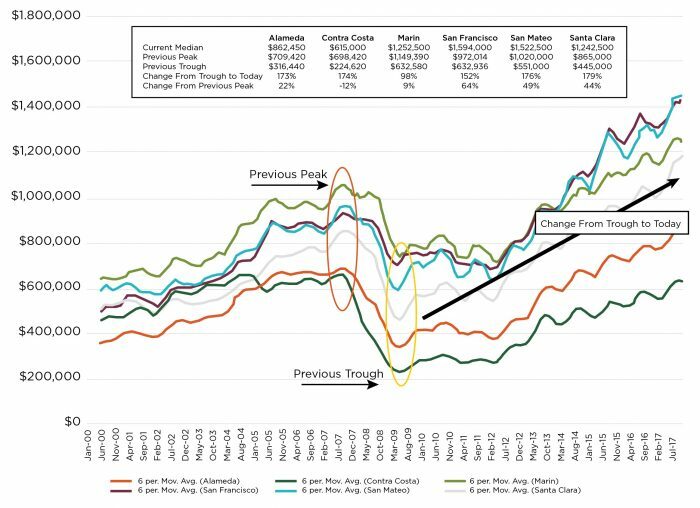 Figure 3 illustrates historical changes in median prices for the Bay Area’s regions, excluding Napa and Sonoma counties. The table in Figure 3 summarizes changes in median prices by region from the last peak and the subsequent trough. The percent changes show how much prices have increased since the trough for single-family homes. All regions, except for Contra Costa County, have current median prices well above their previous peaks, with San Francisco’s median price now 64 percent higher. The increase in prices, along with stronger market competition, inevitably leads to the question of what factors drive demand and if there are signs of a bubble forming. First, the Bay Area’s incredible job growth over the last few years, along with accompanying income growth, has definitely been the biggest stimulus for housing demand. Unlike the last housing surge of the mid-2000s, buyers today are well invested in their homes, with only 10 percent placing less than 20 percent down payments, according to Pacific Union data. The rest of the buyers have either purchased with 20 percent-plus down payments or with all cash. Also, unlike during the last bubble, current demand far outpaces the supply of homes for sale, or homes available in general for the increase in population that the Bay Area has experienced. Next, unlike the proliferation of adjustable-rate and other exotic mortgages seen during the previous boom, homebuyers today are locking in fixed-rate mortgages at historically low rates. Finally, despite the Bay Area’s affordability crisis and home prices that exceed previous peaks, buyers are generally spending a lower share of their incomes on mortgage payments than they were during the previous cycle because of lower interest rates. This is not to say that the Bay Area’s affordability crisis is not severe, and the outcome will be loss of hardworking households that can no longer afford to live here. For more on this subject, the California Association of Realtors recently published a report examining if the state’s housing market is again in a bubble. Lastly, with concerns around proposed tax changes and the impacts on new homebuyers, there is a potential pickup in demand stemming from those trying to take advantage of the more favorable existing tax laws, which would grandfather them in if the looming proposals come to fruition.